Every year at Easter, Recreational Aviation Australia holds its National Fly In (NatFly). This is an event where RA-Aus members, vendors & interested folks come to meet, attend workshops, review vendor offerings, undertake test flights and show off their aircraft. Aircraft range from powered parachutes & ultralights through to home builds and the latest sport & recreational aircraft. Importers and manufacturers are present to showcase their equipment, the circuit is filled with aircraft undertaking demo flights and the local hotels & bars are filled at night with tall tales and recollections. 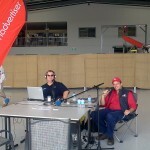 We were fortunate to be invited to attend along with the team from Aviation Advertiser, setting up our mobile recording studio in one of the Temora Aviation Museum’s hangars (along with their Mk VIII Spitfire and Cessna A37). We arrived on the Friday morning and departed on the Saturday evening, experiencing two very busy days packed with interviews, discussions, aircraft & equipment inspections and a couple of demo flights. Suffice to say there was plenty of material captured and we’ve managed to squeeze the best of it into yet another very large episode. We considered splitting it over two but there’s more great content on the way on other topics so we felt it best to pack it all into one large package. We then wrap up the episode with a review of the show between Steve, Grant, Ben & Bas along with a quick chat about the OzRunways application that Bas has been developing.